This is our 2nd family hog hunt at Shiloh Ranch in Oklahoma. Two years ago, our 9 year-old Patrick Lefemine Jr. shot his first big game animal with a bow here. It was a terrific moment for all of his as he made a perfect hit while his 7 year-old brother Matthew watched. This year, it's Matt's turn. After months of practice and preparation, Matt will attempt to do what his big brother did in 2005. Like last time, because this is a short hunt (3 days) we are splitting up a morning and afternoon hunt on separate days. Our first "family bowhunt" was simply incredible. Not only because we shared a very special moment with our son Pat Jr, but more importantly, because Matt and Cheryl Napper, (owners of Shiloh Ranch) took us in as their own and made a lasting impression on our boys. My kids instantly bonded with Matt and Cheryl and couldn't wait to come back. 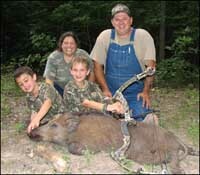 So before we said goodbye to them in 2005, we already had plans for Matt's first hunt in '07. The criteria was the same as last time: we needed lots of opportunities at game, we needed close shots, and we needed a family-friendly operation. Shiloh Ranch certainly fit the bill. Matt is bowhunting first. If he is successful, then Pat Jr. will bowhunt followed by his mom Julie and time permitting, myself. We are hunting together out of a ground blind, and from makeshift ambush spots along roads and trails. 2007 may go down on record as Oklahoma's soggiest to date. Massive flooding and washed out roads are commonplace this summer. We had been watching the weather for ten days prior to our trip and luckily, none of those predictions called for rain. That was, until we got here. It is the first morning of our hunt and it has been raining hard since late last night. We talked with Matt and Cheryl and talked it over. The boys were climbing the walls wanting to hunt. Matt was timing the rain drops hitting his head every 1/2 hour and claiming it was "letting up" but we knew better. A marginal hit in the rain would be trouble. So it was far better to skip the morning hunt and hope it would clear out for the afternoon. The forecast was hopeful, but so was yesterday's forecast. The boys were disappointed but understood why bowhunting in the rain was not smart. Did we get "lucky" last time? Is 9 still too young? In 2007, when my son Pat Jr. took his first shot and killed his first big game animal with his bow, a rush of relief came over me. My son Patrick did it perfect. But what if it hadn't? What if his first shot was terrible and ended in a long, discouraging trail? What if he had lost the animal? This thought ran through my mind two years ago and I have the same thoughts now with my younger son, Matthew. Matt is a born predator. The chipmunks in our rural CT home call him the "executioner." 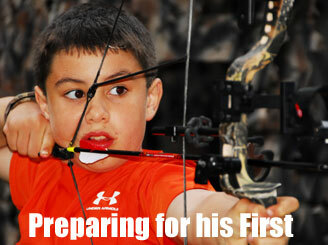 He is single-focused on hunting and shoots a bow extremely well. So these all helped to convince me that he was mentally ready. But chipmunks and cowbirds are far different than a wild boar. At his impressionable age, a good, positive experience can go a long way toward introducing him to a lifetime of outdoor experiences. A negative experience can do the opposite. During our prep, we discussed wounding several times. They understood their responsibilities. They will be taking a life, and that means they needed to be ready and proficient. They took it very seriously and so do I. There was no fooling around. Practice was fun but always productive. After months of training his time is here. 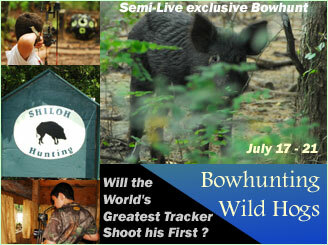 Like our last family bowhut in '05, Bowtech was absolutely terrific working with the kids. I had met with Margaret Knupp, Bowtech and Diamond's marketing manager, and we discussed this hunt. She had several suggestions for us and one of them was Diamond's new "Edge" which provides for easy draw length adjustment, a hard hitting bow in a little package, and the ability to easily upgrade the limbs when Matt was ready to step up to higher poundage. As soon as the bow arrived he started practicing and became exceptional with it in no time flat. For a little guy, he worked himself up to the respectable weight of 40lbs and along with his 24" Easton ICS Junior arrow and a Muzzy 90gr 4-blade head, he was shooting just about 180fps. The arrow weight was a bit light, but I was confident he had the K/E to shoot a medium sized hog. While Matthew was convinced he needed to shoot one of Shiloh's famous 300lb tuskers, I knew that wasn't happening. 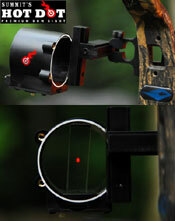 For a bow sight, we went with Summit's new Hot Dot sight. My son Matt had met Will Woller during a recent hunting show. We had dinner at a chinese buffet and Will nicknamed Matt "Sugar Tang" after a fortune inside a fortune-cookie. Matt really liked Will and when it came time to pick out a sight Will graciously sent "Sugar Tang" along with my son Pat Jr. a Hot Dot sight. They thought the sight was cool, and I liked the fact that it cured them of tilting their bows. We had both sights set up very simple. A single red dot set at 12 yards. Muzzy, who has always been family-friendly, sent my sons their favorite broadheads; Muzzy 90 grain 4-blades. I liked these heads because of their exceptional penetration abilities and the additional cutting surface of 4 razor sharp blades. They have a lower profile than the newer MX-3 and MX-4 heads which I like, and they are not quite as heavy as the 3-blade 125's that Julie prefers. To wrap up the gear ensemble, we used Realtree camo in both Realtree green HD and the new AP pattern.